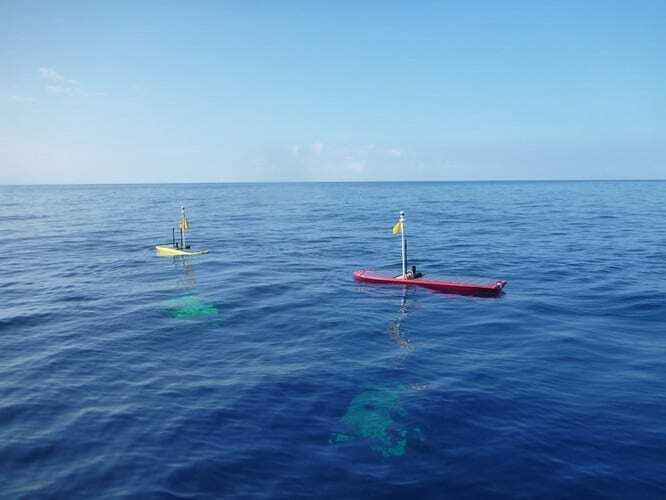 The Liquid Robotics Wave Gliders have been plying the ocean for months, powered by nothing but the waves. Today, they got a big upgrade. Last December, a group of four Wave Gliders took a 9,000 nautical mile autonomous trip from Northern California to Australia. They moved slowly–one and a half knots at most–and used their onboard sensors to measure all sorts of data points, including salinity levels and phytoplankton activity. Liquid Robotics and its fleet these of surfboard-sized wave-powered boats are revolutionary for companies that work in the water. Today, Wave Gliders are used for over 60 applications–oil and gas exploration, fishery management, carbon output measurements, and more. They sense all the things that satellites and other boats miss. And this week, Liquid Robotics announced that a supercharged, wave and solar-powered version of the tiny boat, the Wave Glider SV3, is available to order. There are some big differences between the SV3 and the original Wave Glider, which will get some upgrades of its own along with a new name (the SV2) later this year. Instead of propelling itself by wave power alone, the SV3 uses a combination of wave and solar power (previously solar power was used just to power onboard equipment) to go faster. It has an expandable power system, an operating system that lets the boats operate in swarms, and the ability to grant multiple customers secure access to data from the same boat (Liquid Robotics lets customers pay for access to Wave Gliders without actually purchasing them).